Oh no! They are here again, all these terrible zombies. You should help the Big Hero and save the planet and kill all the zombies here. So, just beware of any troubles and become the best zombie killer! You will cope with it right now! It is so awful! There are so many zombies! Just become the real hero and kill them all. 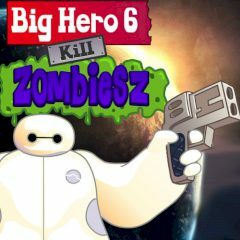 This horde of zombies wants to occupy the city and kill humans, in order to protect the city and the people, the big hero 6 took up arms to kill them all! Could you believe that? Then just be really careful and use your huge weapon to kill them all. Do you think that it is so easy? Well, then just try it right now and you will really cope with it. So, everything depends on you here. Use the mouse to shoot and A, D to move.